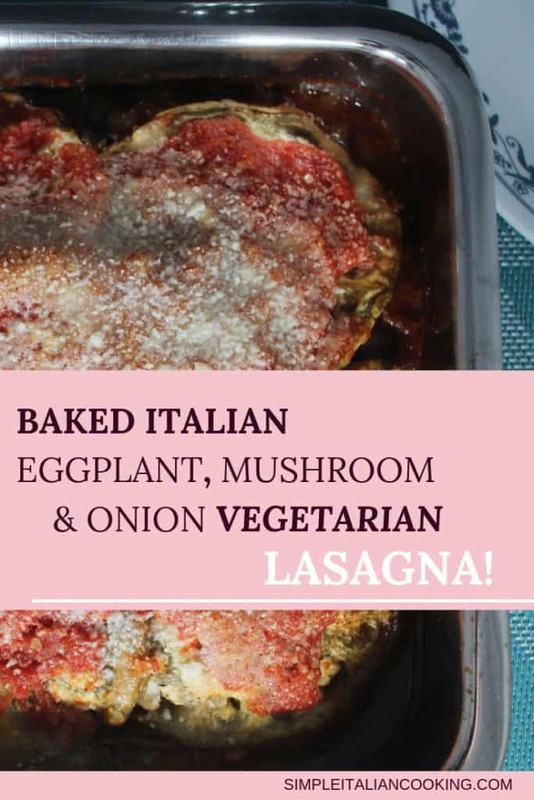 This Italian recipe incorporates ingredients any local grocery store will carry, specifically eggplant, mushrooms, and onions, making this recipe for an easy vegetarian eggplant lasagna completely doable! It’s an easy recipe that is full of robust flavor, is satisfying, and will have everyone wanting more! 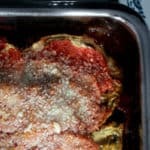 Learn how to make this eggplant lasagna recipe using the basic principles of any lasagna by layering the ingredients and then baking. Make sure not to skip the first few steps as they are critical to saving you time in the long run! You’ll need a frying pan to first saute the mushrooms, onions and herbs in olive oil. I prefer to use my 5 1/2 quart Cuisinart French Classic stainless steel pan which I mention frequently in my recipes as it has high sides and heats extremely well. In a nutshell, while the mushrooms and onions (and herbs) are sauteing, you broil the eggplant slices on cookie sheets/pans, which takes no time at all. Once everything is ready, you layer the ingredients combined with some tomato sauce and top with Romano cheese and bake covered for about an hour. Make the recipe even easier by using a can of pureed or dice tomatoes put through a blender or nutri-bullet for a few seconds. Don’t worry about seasoning the tomato sauce, you’ll get the seasoning through the other ingredients in this recipe. Here’s the recipe, but please also read my notes beneath that give some insight, especially if you are new to cooking. An easy to prepare and bake recipe that uses eggplant, mushrooms, onions and Italian herbs and Italian cheese. 1 peeled and sliced eggplant slice in 1/4"
Meanwhile peel and slice the eggplant into 1/4" slices and lay them on a greased cookie sheet (use a drop of olive oil to grease the sheet/pan. Set aside. Heat the olive oil in a large frying pan over medium heat then add the mushrooms and onions and stir frequently. Turn up heat a little. When the Oven is ready, add the eggplant slices and broil for 2 minutes on each side. They should be thinner, dryer and beginning to turn slightly brown. Set aside. In a baking dish, layer the eggplant, then mushrooms and onion mixture, small amount of the cheese (save most for the last layer), then the tomato sauce along with a drizzle of olive oil too. Use the excess flavor-filled lasagna liquid as a sauce for some side pasta! It's amazing! While I’ve certainly made regular noodle lasagna and eggplant lasagna before, this recipe is different for a few reasons. It’s somewhat like a cross between an eggplant lasagna and a eggplant Parmesan. You don’t smother the ingredients with cheese between layers and I don’t use ricotta or mozzerella which are two primary cheeses in a typical lasagna. You don’t use noodles like a standard lasagna either. Don’t be fooled into thinking you can skip these first two early steps of broiling the eggplant and sauteing the mushrooms and onions. Both are critical and the 10 minutes you devote to these two steps will in the end save you much more time. Broiling the eggplant is important because it reduces the water content and softens the eggplant so it cooks quicker when baking. Otherwise you’ll either be cooking it for 90 minutes vs 60, or it will end up chewy and under-cooked. You’ll want to broil the eggplant slices on both sides until it gets slightly brown – only about 2-3 minutes each side at about 525F. Remember don’t use parchment paper at this high temperature. When done, remember to reduce to the baking temp of 375F. Why you should not skip sauteing the mushrooms and onions! Sauteing the mushrooms and onions in extra virgin olive oil along with the herbs and chopped garlic is important too for the same reasons. Mushrooms have a lot of liquid content and you want to make sure you get as much out as possible. Regarding the onions, if you’re familiar with baking with onions you know that if you don’t saute the onions enough for a baked recipe like this, they most likely will not cook down enough in the oven and you’ll end up with a lasagna with crunchy onions. Something we want to avoid! Again, cook everything down until barely any excess liquid remains! This is about 10 minutes at a medium – medium high temp. Don’t brown the onions! Use a good strong olive oil if you can. This is why I typically just always cook with extra virgin olive oil (first cold press). Lately I’ve been using a Sicilian olive oil that is amazing! We order it online from Walmart. Unfortunately it’s not organic but is non-gmo. 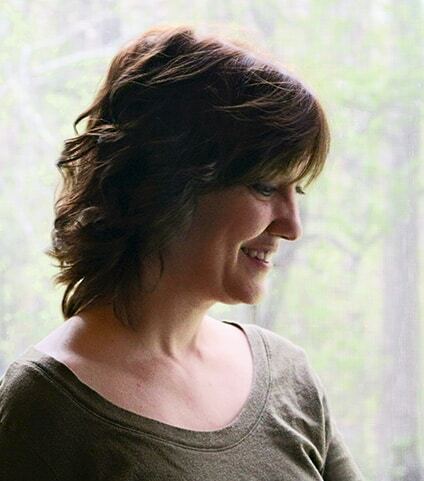 If you are interested in ordering organic olive oil online try amazon or Vitacost or BJs. Don’t saute in butter, although it may and will still taste amazing the flavor will be slightly different. Keep to the olive oil, it’s more economical anyway. For this recipe we use dried parsley flakes and dried basil and garlic. I like the ability to distribute the flavor more evenly this way, but if it were summertime you could use fresh herbs and chop them finely. I’d double the fresh herb quantity. Adding the herbs to the onion and mushroom mixture helps distribute the flavor. You’ll be quite excited once you start smelling the aroma. These are the types of recipes that makes you fall in love with Italian cooking! I’ve seen so many recipes on Pinterest and online that claim to be healthy and then they load it up with tons of cheese. For this recipe it doesn’t need a lot of cheese. I recommend Romano cheese as I almost always recommend. A little goes a long way and has a ton more flavor than Parm. We sprinkle the cheese between a few layers, but most of the cheese is on top. This recipe just simply does not need a lot of cheese to make it taste good. In fact, too much cheese will detract from the base flavor of the eggplant, mushrooms, onions and herbs. If you’re unsure about Romano, check out my post on how to buy and store fresh Romano cheese economically by using the Cuisinart the grater disc. Any food processor would probably work if they have a grater disc. One last note, this baked dish produces a lot of liquid when baking, even after the broiling and sauteing, don’t waste this juice! It makes a delicious light sauce for your angel hair, vermicelli, fusilli, or other delicate pasta. I don’t recommend shorter thick pastas like ziti.